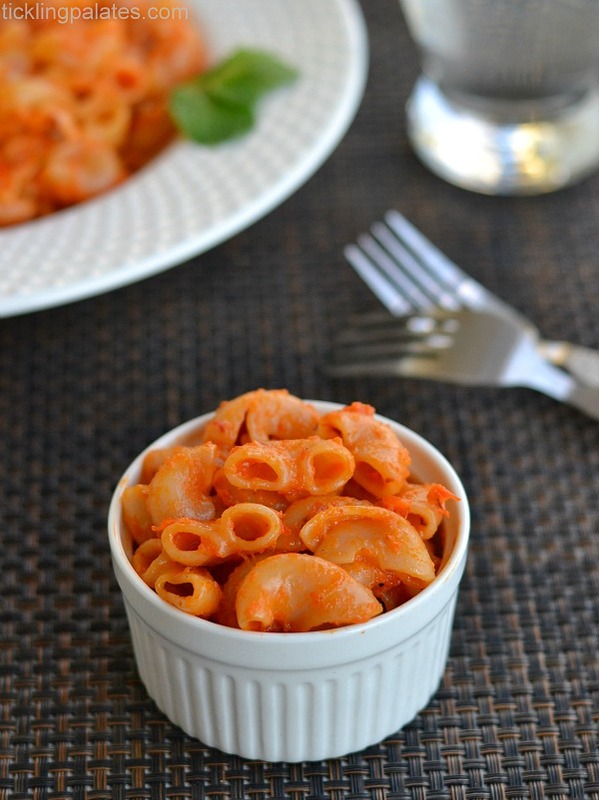 Pasta in Roasted Red Bell Pepper Sauce. 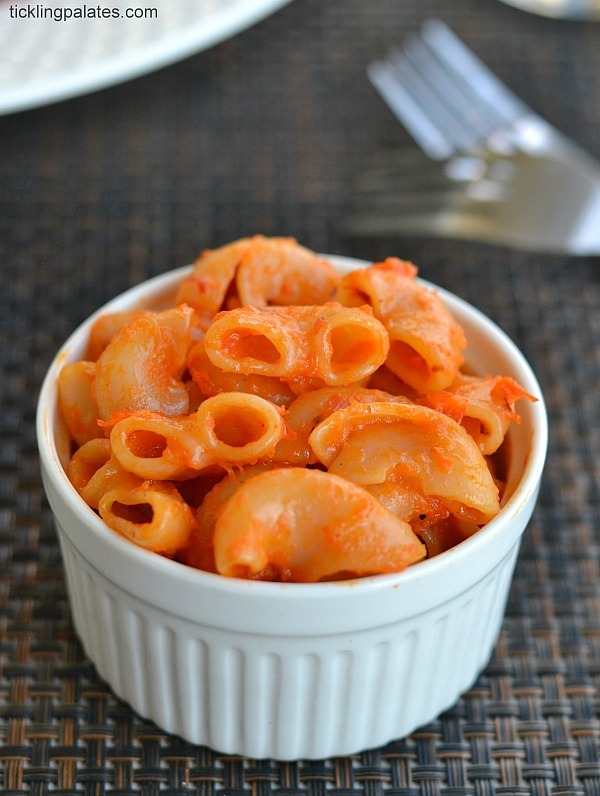 This Macaroni Pasta cooked in vegan roasted red bell pepper sauce is mildly spicy, creamy and filling. It does not need any cream as a thickener or cheese to taste great. It’s definitely a kid’s delight and is perfect if you are planning for a continental dinner or for the kids lunch box. Pasta is a recent love of my kids and I’m sure it’s only after seeing other kids eat pasta at school. But whatever may be the case, I’m glad that they have started to love eating pasta. So I have started to pack this for kids’ lunch box often now-a-days and they love it so much. I’m sure your kids will love it too provided they do not mind eating cold pasta but with some cheese sprinkled on top, I’m sure they will absolutely overlook that small thing. Apart from this Basil Flax Seed Pesto and Marinara Sauce, I love this roasted red bell pepper sauce so much that I always have it stocked up in the fridge as it stays well for a week. Storing the sauce is a life saver as you can whip up the pasta in no time at all. As the pasta is free of cream and cheese weight watchers and calorie counters can indulge safely without any hesitation. I have not added cream to the pasta and despite that it turned out saucy as you can see for yourself. Also I have skipped adding cheese to my serving but added it to individual bowls while serving the kids. So skip the cheese if you want a totally vegan pasta dish. As the red bell peppers are rich in anti oxidants, I’m sure you definitely do not need an excuse to serve this red bell pepper pasta to your family members often. 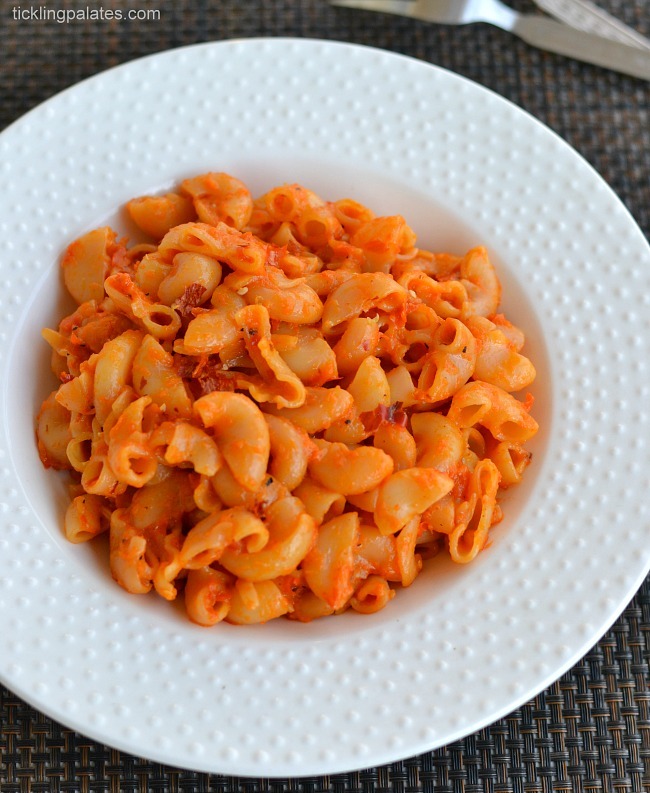 If you have the sauce at hand like I often do making this pasta only takes less than 15 mins. Isn’t that just great? Though I have used macaroni pasta or elbow pasta here, feel free to use any type of pasta you have at hand. Also you can use vegetable stock during the final toss of pasta to make it tastier and flavorful. 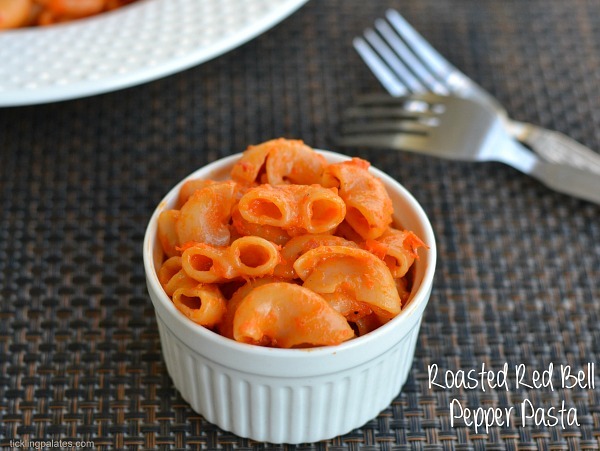 Easy pasta recipe in roasted red bell pepper pasta. Bring 5 to 6 cups of water to a rolling boil in a wide saucepan. Add the pasta and let it cook till Al dente or simply follow the instructions given in the pack of the pasta. Once cooked tip the contents into a colander. Reserve 1/4 to 1/2 cup of cooked pasta water. Heat a pan and add the red bell pepper pasta sauce, cooked pasta water, Italian seasoning, salt and mix well and let the sauce come to a boil. Add the drained pasta and cook for 2 mins while tossing it, till the pasta comes together and becomes thick. 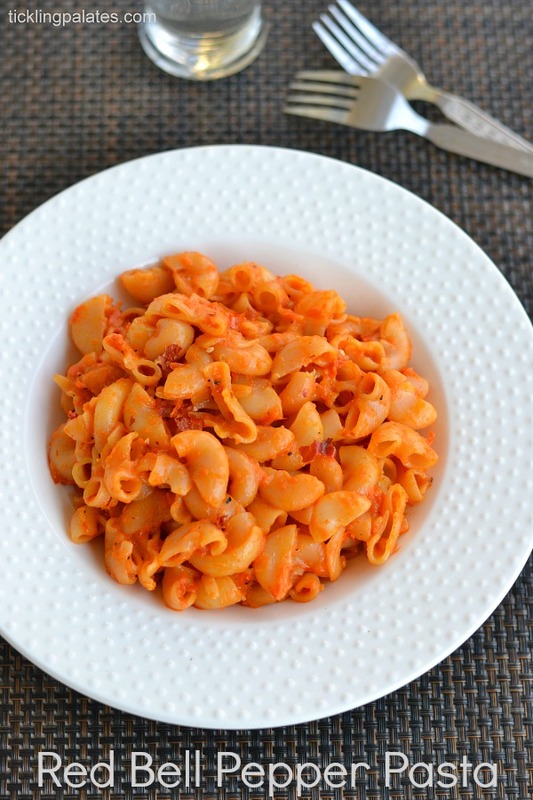 Pasta in roasted red bell pepper sauce is ready. Take off fire and transfer to a serving bowl. Sprinkle red chili flakes, grated cheese on top (if using) and serve piping hot. This pasta looks fantastic!! I am loving how simple this looks! I made this for dinner tonight and it came out really well. Thanks for the recipe.. And your blog is great with easy recipes.. Way to go.. Happy to hear your positive feedback Subbu. Thank you very much.